Amanda, what kitchen colors stood out at this year’s show? Overall there was a huge trend with eye-popping colors in home appliances. KitchenAid had a baby blue professional range. 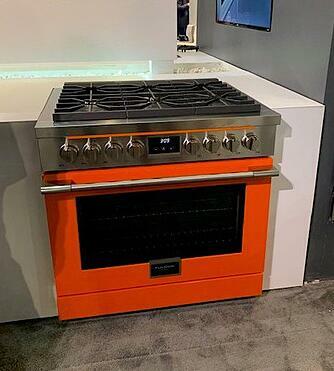 We also saw some of the higher-end professional grade appliance manufacturers rolling out different color options. 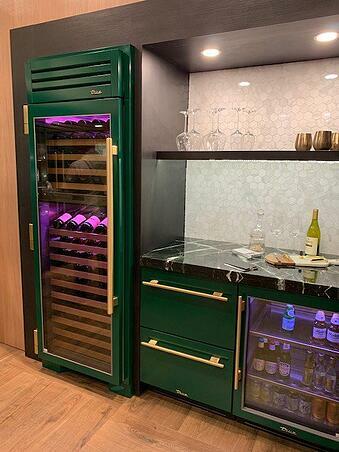 True® Refrigeration showed an emerald green that was a much talked about refrigeration display. And Italian manufacturer Fulgor Milano had neon green, orange and white ranges. Outside of these “eye-popping” choices, were there other colors that caught your eye? Yes, a few manufacturers rolled out a new color that is a warmer stainless with a brown or bronze accent that I thought was striking. Whirlpool, which is EYA’s ace appliance offering in many of our communities, called the color Sunset Bronze. It’s a nice complement to all the brass and brushed gold accents we’re seeing throughout cabinet hardware and plumbing. 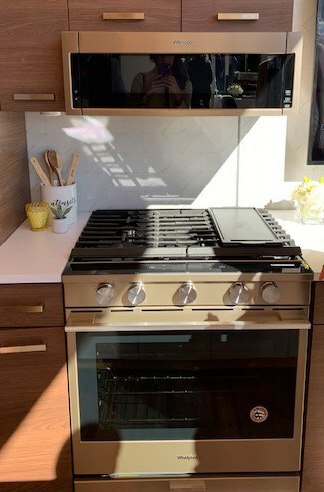 The whole Whirlpool suite – oven, over the range microwave, refrigerator -- is available in Sunset Bronze. At last year’s show, you reported on an emerging trend with appliances in a matte black color. Did you continue to see this color choice? Every single plumbing, appliance and cabinetry hardware manufacturer there was featuring matte black. But there is a question of durability associated with the black stainless. We’ve heard some negative feedback from our appliance distributor about the black stainless scratching easily and showing more wear and tear. So at EYA, we’ve been hesitant to offer it as an alternative to regular stainless in our homes. But this Sunset Bronze really caught my attention because it appears to be a slightly more durable surface. Anything in the kitchen that is black or dark is going to show more fingerprints and scratches. The bronze is similar to a regular stainless steel in saturation, so I wouldn’t anticipate it being any different in care and maintenance. What’s new in the bathroom? The black color trend continues into the bathroom. There were two manufacturers of shower doors that had a full series of black trims and accents so you can coordinate the full suite. That’s been a little bit of an issue. 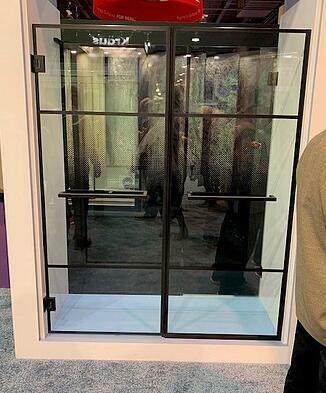 Previously shower doors had not been available to match all the black faucets, fixtures and hardware finishes that have proliferated throughout the home. Just like the trends with the black windows on the interior, the shower doors with black really accent that same aesthetic. It’s striking…really lovely. Let’s shift from colors and finishes to technology. What’s the latest in kitchen automation? A few years ago, Samsung really made its name in the marketplace by having connected appliances. They had a system called the family hub that is basically an iPad screen on your refrigerator. This year, I saw that trend of connected appliances tied to home automation or applications across the board with nearly all appliance manufacturers. KitchenAid and Whirlpool have an app called Yummly. They even sell their own dedicated Yummly device that is essentially an iPad for the kitchen. It has many different functions including an app that can scan ingredients for whatever you have in your pantry and pull up recipes. Bosch Thermador, the other manufacturer we use in our communities, has an app called Home Connect that also integrates with your smart home systems. You can select a recipe and send it directly to your connected oven that will preset the cooking temperature and time for your recipe. It also gives you control of your appliances from your smart phone. Do you see these apps and home automation systems catching on with homeowners? It still seems to me that you have to go outside your normal pattern of life to integrate this technology. But as these manufacturers get smarter and more savvy….as homeowners start to use more home automation with Google Home and Alexa….and as buyers become more comfortable with devices controlling their door bell and thermostat, which they do with our homes now, the integration of your appliances is going to happen. It still feels cutting edge, but within two to three years, homebuyers will be savvy enough to ask for these features or will start implementing them in their own homes. What I liked about this technology -- especially what we saw from Bosch Thermador -- is that it remains behind the scenes. You can still operate your oven in the traditional manner, and you only interact with the technology if you choose to do so. It doesn’t change the aesthetic, appearance or functionality of the appliance. I think if some buyers are forced to use the technology they become resistant. The Kitchen & Bath Industry show is held in conjunction with the annual International Builders' Show (IBS). Look for our next interview with EYA’s Brian Zdgiebloski, Director of Architecture, and Tim Shaver, Director of Procurement, who will discuss how wellness is being integrated into home design based on what they saw at IBS in Las Vegas.